Ombre is new glitter. Of late, the ombre trend has gained a lot of popularity in weddings, and more and more couples are opting for it. From decorations to bridal gowns, ombre is in big time everywhere. Another big reason why Ombre cakes are huge right now is that they look good in photographs. Shades from dark to light and soft fading effects make the cake look awesome. Additionally, Ombre cakes can also have surprise ombre interiors. This is made by stacking various layers of cakes; each layer having a lighter shaded than the previous layer. The colours transition seamlessly from one layer to another. The “Dainty Ombre Blossom Wedding Cake” is made up of three tiers covered with white fondant. 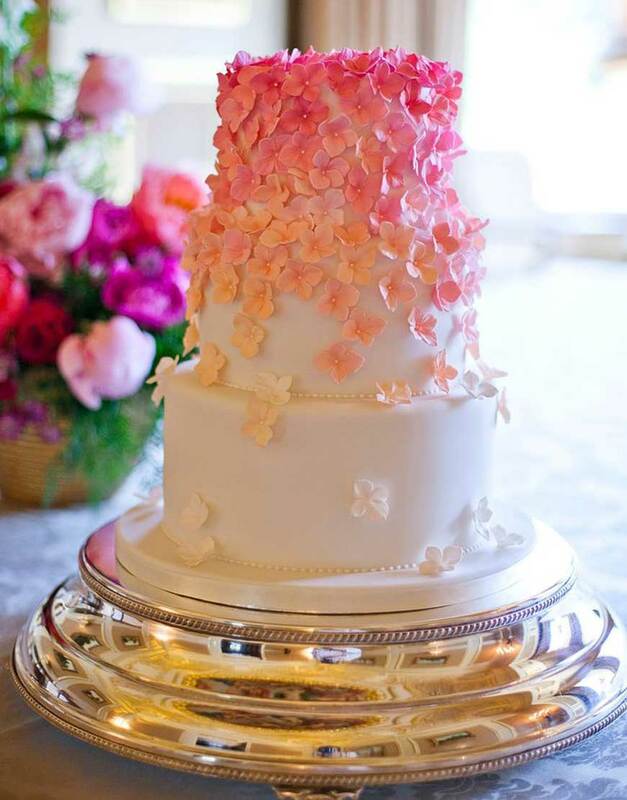 Here the ombre effect is created using fondant blossoms which transition beautifully from white to pink. The flowers are handmade with utmost care keeping in mind the shape and perfecting the colour by our talented chefs. Make your guests go “Wow” with our wide range of fancy wedding cakes. Get in touch with us to place your order.